1. Automatic frequency tracking ensures that the machine always works on the best frequency and performs more steadily. 2. The handpiece is detachable and can be autoclaved to the high temperature of 135°C and pressure of 0.22MPa. 3. Digitally controlled, easy operation and more efficient for scaling. 1. The handpiece is detachable and can be autoclaved to 135℃ and 0.22MPa. 3. 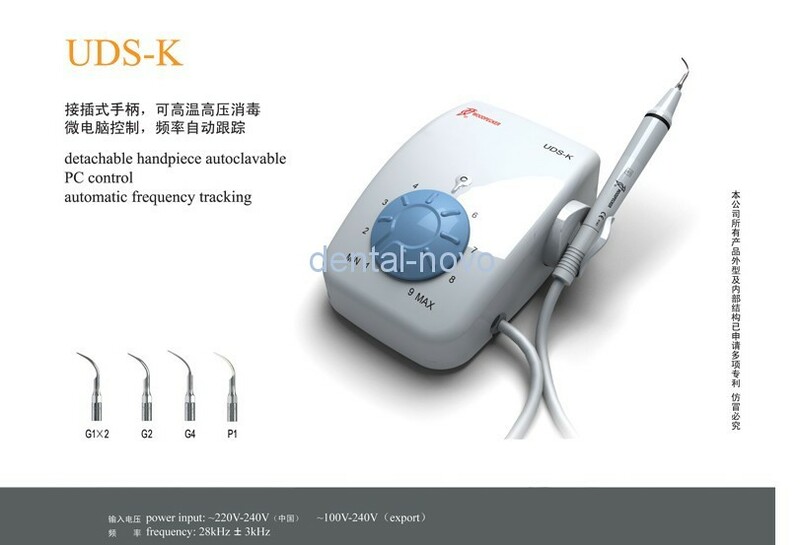 Assembled with excellent piezo-ceramic, the handpiece has high and lasting power and generates little heat. 5. The scaling tip is made of special material. The cavitation produced from the end of scaling tip makes the cleaning of teeth and the killing of germ easily. 7. Automatic frequency tracking ensures that the machine always works on the best frequency and performs more steadily. 8. Digitally controlled, easy operation and more efficient for scaling. 9. Compatible with EMS, you could connect your EMS handpiece with this control box, and you could also connect this Woodpecker UDS handpiece with EMS control box. 10. CE and FDA certificated.